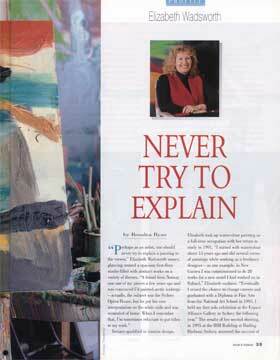 �Perhaps as an artist, one should never try to explain a painting to the viewer.� Elizabeth Wadsworth muses, glancing around a spacious first-floor studio filled with abstract works on a variety of themes. �A friend from Norway saw one of my pieces a few years ago and was convinced I�d painted arctic icebergs � actually, the subject was the Sydney Opera House, but he put his own interpretation on the white sails and was reminded of home. When I remember that, I�m sometimes reluctant to put titles on my work. 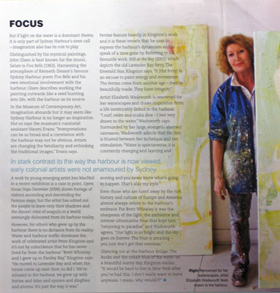 Tertiary-qualified in interior design, Elizabeth took up watercolour painting as a full-time occupation with her return to study in 1991.�I started with watercolour about 15 years ago and did several series of paintings while working as a freelance designer � as one example, in New Guinea I was commisssioned to do 20 works for a new motel I had worked on in Rabaul.� Elizabeth explains. �Eventually I siezed the chance to change careers and graduated with a Diploma of Fine Arts from the National Art School in 1993. I held my first solo exhibition at the Espace Alliance Gallery in Sydney the following year.� The results of her second showing, in 1995 at the IBM Building at Darling Harbour, Sydney, mirrored the successs of the debut. It sold out completely and led to the inclusion of selected pieces in subsequent exhibitions throughout the city. Her latest painting, a 3m x 2m canvas titled Impinging on the Dam, was completed recently. Elizabeth describes her as �very organic�. � My subjects are often landscapes, nature based with an emphasis on water and the sea,� she says �I enjoy working with colour and mark making, with lots of energy. It�s gestural, with layers of thick and thin paint.� Contrasting blues and oranges � �jarring colours�, in the artists words � interspersed with softer nuetral tones are characteristics of her style. As inspiration, Elizabeth draws on everyday images: personal photographs and clippings gathered from magazines, sketches and a host of memories. A series of figurative African works was based on a journey through that continent several years ago. Elizabeth is supported in her ambition by her husband Robert, and sons, 17 year old Andrew, an aspiring painter, and his 15 year old brother Anthony, who is a vocalist and musician. 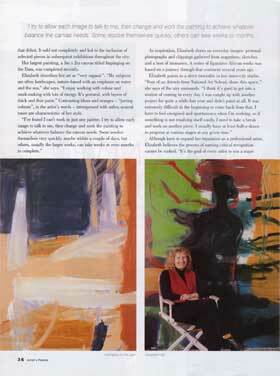 Elizabeths work will also go on show to a Sydney audience at the Exhibitionist Gallery, Surry Hills, in May 1998. It means that she is sure of where she's at, sure of where she's going and there is as much to be looked back upon - with great pleasure - as there is to anticipate in the future. If that sounds somewhat mystical, so be it - dive into her richly painter, masterly seascapes and it's difficult not to be swept into waves of philosophical musing. Looking back over her abstract land and seascapes - in the main, aspects of the Australian continent - and you find canvases which are apparently simple on the surface and yet stay in the mind and resonate. This new collection celebrates and explores the ocean in all its moods and possibilities, from exhilarating to melancholy, all-embracing to terrifying. At the same time, the nature of abstraction leaves the viewer to that personal interior world of dreaming and imagining which makes works such as these as pleasurable as they are. Whether the harbour is first glimpsed through the sandstone heads, from the 20,000 feet above or is part of an everyday childhood, the fingered waterways and brilliant diamond light invoke sentiment in us all. As the driving force behind a series of exhibitions at the museum which explored artists� experiences of Sydney, and a keen kayaker in his spare time. Emmett is no stranger to the allure of the harbour. In stark contrast to the way the harbour is now viewed, early colonial artists were not enamoured by Sydney. Many painted the harbour to document the scenery and the growth of the colony but found both Sydney�s natural, and gradually developing built landscapes, uninspiring. Sydney Harbour�s sandstone cliffs surrounded by dry scrub and bewildering flora did to live up to artists� idea of beauty found in the tames, lush scenery of Britain. As painting and artefacts were sent back to Britain and settlers joined the colony by choice, attitudes towards Sydney Harbour began to change. Arriving in 1835, travelling artis Conrad Martens became fascinated by the play of light on the harbour and is hailed by Emmett as the first Sydney artist �with desire to explore the atmospheric effects of the harbour and his emotional response�. Illustrious Sydney Harbour painter Lloyd Rees was also intrigued by the harbour light. Described his style, Emmett says: �He didn�t paint the Sydney icons but the atmosphere and ever-changing light on the water.� Rees was spellbound y Sydney and the elusiveness of the harbour and harbour and continued to find new ways to paint it for much of the 20th century. The seductive harbour light has been the trigger for myriad artists, not leat the city�s pre-eminent photographers, Max Dupain and David Moore, both of whom were beguiled by its effects. In his quest, Moore shot the haunting Sydney Harbour from 20,000 feet (1966) � a work which Emmett admits to having been �drawn to, almost obsessed by, because it captures the extraordinary sense of the harbour�. 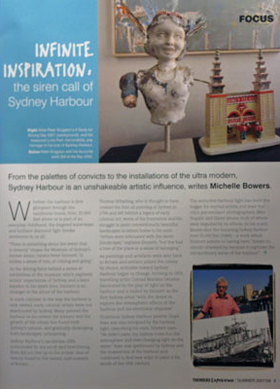 But if the light on the water is a dominant theme, it is only part of Sydney Harbour�s siren call � imagination also its role to play. Distinguished by his mystical paintings, John Olsen is best known for the mural, Salute to Five Bells (1963). Harnessing the atmosphere of Kenneth Slessor�s famous Five Bells and his own emotional involvement with the harbour, Olsen describes working the painting outwards like a see bursting into life, with the harbour as its source. In the Museum of Contemporary Art, imagination abounds but it may seem like Sydney Harbour is no longer and inspiration. Not so says the museum�s curatorial assistant Naomi Evans: �Interpretations can be so broad and a correlation with the harbour may not be so obvious. Artists are changing the familiarity and rethinking the traditional images,� Evans says. A work by young emerging artists Jess MacNeil in a recent exhibition is a case in point. Opera House Steps December (2006) shows footage of visitors ascending and descending the famous steps, but the artist has edited out the people to leave only their shadows and the distant cries of seagulls in a world seemingly dislocated from its harbour reality. 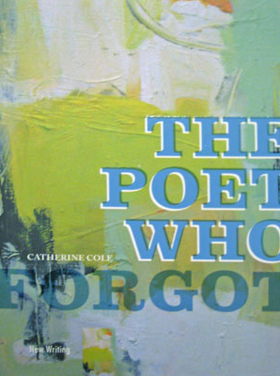 Elizabeth Wadsworth supplied original artwork for the cover of this collection of new writing by Catherine Cole. 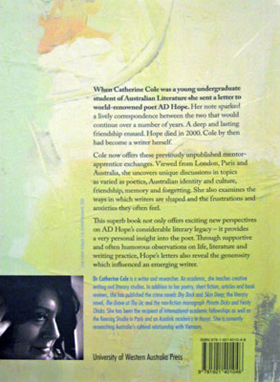 This Superb book not only offers exciting new perspectives in AD Hope's considerable literary legacy - it provides a very personal insight into the poet. Through supportive and often humorous observations on life, literature and writing practices. Hope's letters also reveal the generosity which influenced and emerging writer.